On Friday, the Dow hitting 10,000 still seemed to be a remote possibility, but today, that is starting to become a reality. We have warned on near daily basis about the danger of carry trades. Although the EUR/USD’s reaction to the systemic risk in the financial markets was not as clear, there was a clearly negative implication for USD/JPY. Not only did we talk about the 70 percent correlation between the S&P 500 and USD/JPY, but there is also a similarly tight correlation between USD/JPY and the VIX index, which measures the volatility of the stock market. This means that the weakness in stocks and the rise in volatility drove USD/JPY below 105. To put today’s move into perspective, the drop in US stocks today was the most since the September 11 attacks in 2001. Unless stability returns to the financial markets, all of the Japanese Yen crosses including USD/JPY will continue to suffer. WILL A FED RATE CUT BE ENOUGH OF A LIFELINE TO SAVE THE MARKET? Since the beginning of the year, we have lost 3 of the largest investment banks on Wall Street and such unprecedented developments have called for unprecedented actions by US government and Wall Street officials. Since the announcement of Lehman Brothers filing for bankruptcy and Bank of America taking over Merrill Lynch, AIG has been given special permission by US authorities to tap into $20bln of its own capital to prevent a liquidity crisis and credit downgrades. The Federal Reserve is also holding a special meeting to discuss possible remedies to AIG’s problems. The ECB and the Bank of England have pumped more liquidity into the financial system while the Federal Reserve made an unusual intervention to drive Fed funds lower. Why Did Fed Funds Soar to 6 Percent when Futures are Pricing in a Rate Cut? Fed fund futures are pricing in an 80 percent chance of a 25bp rate cut tomorrow by the Federal Reserve. This is a big change from last week, when the only thing that the market was thinking about was a rate hike. However despite this sharp shift in expectations, Fed funds surged to a high of 6 percent, 400bp above the Fed’s target rate of 2 percent intraday. This jump in the overnight lending rate between banks indicates that no one wants to take on risk. Trust is a commodity these days as the move in Fed fund futures suggests that no one knows if their counterparty will be here to survive another day. Fund funds gave back all of its gains by the end of the US trading session, but that does not mean that risk appetite has returned – quite the contrary. AIG is in big trouble, Washington Mutual is still on our watch list with their bonds now cut to junk status by Moody’s and the worries now turn to Goldman Sachs and Morgan Stanley who will be releasing earnings this week. Large write downs could drive a nail in the coffin for the US stock market and USD/JPY. 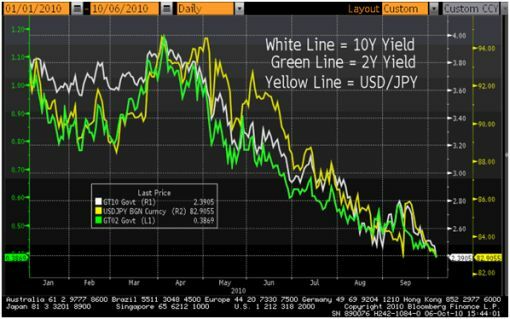 Of all the pairs in the currency major, USD/JPY and other carry trades will be hit the worst. Over the past 3 years, there has been a 68 percent correlation between the VIX and USD/JPY, so higher volatility means trouble for the currency pair. Although consolidation in the banking sector was something many people expected, no one thought that the consolidation would occur because of Chapter 11 filings. Will a Fed Rate Cut be Enough to Shore Up Confidence and Trigger a Reversal in the US Dollar? Pandemonium has hit the financial markets. The dollar is trading below parity against the Swiss Franc, it has fallen to a new record low against the Euro and to a new 1995 low against the Japanese Yen. Yes. The futures curve is currently pricing in a 90 percent chance of a 100bp rate cut and a 6 percent chance of a 10 percent rate cut. By the end of June expect rates to come down to 1.5 percent. This is the minimum that the Federal Reserve must do to stabilize the financial markets. If they want to put an end to the pain however, they will need to be more creative. The discount rate cut on Sunday is not enough. What is 25bp really going to do for the markets? Banks are in seizure mode and are focused on nothing but minimizing counterpary risk. LIBOR rates are skyrocketing and everyone is holding their breath, waiting for the next shoe to drop. For this reason, the dollar and carry trades will continue to weaken. Not anytime soon. The Japanese have expressed concerns about disorderly movements, but since their last intervention in 2004, their top priority has been to convince China to revalue their currency. I doubt that they will be willing to risk the past 4 year’s efforts 3 weeks before the finance minister’s meeting in Washington DC and 4 months before the G7 meeting that they will be hosting. As for the ECB, they are worried about sharp and excessive moves, but they have their eyes peeled on 1.60. As long as we hold below that price level, I don’t expect any verbal intervention because in 2004, the EUR/USD rallied 13 percent in 2 months before the ECB called the move brutal. If we count 1.59 as the high today, the EUR/USD has only appreciated 10 percent over the last 2 months. The ECB’s top priority is inflation. The strong Euro is cushioning the pain on high commodity prices. Don’t expect the Fed to come out and buy dollars either. They need a weak currency to draw in foreign investors that may be looking for value and to boost exports. However this is not to say that there couldn’t be a coordinated liquidity injection or a similar move reflecting solidarity amongst global central bankers. With high volatility in the stock market, and 300 point swings in currencies, don’t expect a recovery in carry trades either. If anything, expect further weakness in USD/JPY to drag the other yen crosses lower. The demise of Bear Stearns has made everyone gun shy. I am sure that risk managers across Wall Street banks are on red alert, forcing their traders to minimize risk.